The Fire Zouaves are continuing their pranks, and expounding to the terrified people of this city their very free and easy ideas about property. Yesterday a squad went into a boot-store, cast off their old leathers, selected the best and walked off, telling the tradesman that the Government would make it all right. To-day they have been ransacking the Capitol like so many rats, breaking open doors, ripping cushions, and tearing up carpets, knocking down the guards, and chasing imaginary Secessionists through the streets — jumping on coaches, and going it. pell-mell. One fellow came across a pig near the White House, when I was up there this morning; he incontinently seized his porcine majesty, ripped out his bowie-knife and cut his throat, swearing that pigs had no business in Washington. 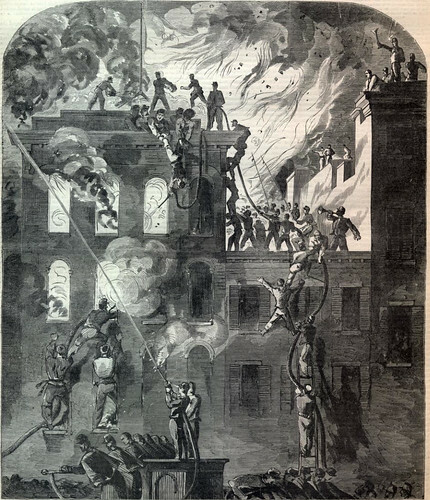 There was much excitement during the night, owing to the unhappy occurrences of the previous evening, which culminated this morning in a fire, which broke out in the small hotel adjoining Willard’s, raging furiously, and threatening the destruction of Willard’s. Col. ELLSWORTH ordered one hundred Zouaves to assist in extinguishing it. The order was followed by nearly the whole Regiment jumping from the windows of the Capitol and scaling the fences. They could not enter the engine houses, and broke down the, doors, taking out the machines, and reached the spot before the city firemen were awake. They worked like heroes, performing wonderful feats of agility and bravery. They formed pyramids on each other’s shoulders, climbing into windows, scaling lightning-rods, and succeeded in two hours in saving the whole structure. WILLARD treated them handsomely, and says that without them everything would have been lost. This has made the regiment very popular among the citizens They destroyed nothing unnecessarily, and nothing is missing of all the great mass of property moved into the streets, which they guarded. For want of a ladder, two Zouaves held another down from, the eaves, while he, with his head down, played water into the burning building. Col. ELLSWORTH’s Zouaves will to-morrow encamp on the Government Insane Asylum Heights, overlooking the Potomac. This entry was posted in New York, Washington, Zouaves. Bookmark the permalink.